Why can’t DIRECTV dishes be smaller? Your standard DIRECTV dish is just a shade over a yard wide. That’s about double the width of the original DIRECTV dishes. Everything else in the world gets smaller, but some how dishes get bigger? How can that be? 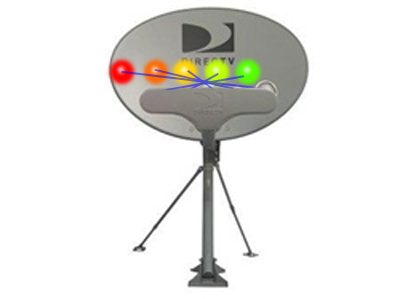 The answer, to anyone with some knowledge of the DIRECTV world, is clear: Where once every single DIRECTV channel resided on one satellite, now there is a whole fleet of them occupying four different orbital locations for US English language programming alone. There’s a fifth location that is used for international programs but it requires a separate dish. Pointing at all those locations at the same time requires a bit of fancy math where signals from different locations bounce off the back and land on the front of the dish where they’re received. I did this diagram several years ago and it still shows the problem. That extra big dish is primarily needed for DIRECTV’s satellite locations at 110 West (used exclusively for Puerto Rico) and 119 West. Those locations are quite a bit off center from DIRECTV’s main location at 101 West. There’s a bit of hope for a smaller dish, though, since the 119 location will be taken out of service in the next few years. That just leaves three fairly close satellite locations, at 99, 101, and 103 West. So a smaller dish should be possible, right? The thing about satellite dishes is that they have to be cheap and reliable. Residential customers generally don’t pay for their satellite dishes, yet they have to work through harsh weather for years and years. Over the last decade, DIRECTV has engineered the standard Slimline dish to be inexpensive, easy to assemble, and reliable. Unless there’s a reason to re-engineer them, they aren’t going to change. The current dish size is actually dictated by an FCC rule saying that homeowners’ associations can’t stop you from putting up any antenna or dish smaller than 1 meter (39 inches) in all directions. So the DIRECTV Slimline dish is made to be as big as it can be and still fit under that rule. There’s no real economic pressure to make it smaller for most home installs. However, I can tell you that our partners in the marine satellite dish industry are working on engineering smaller dishes that will pull in all the satellite locations. Right now the HD dish for DIRECTV from our mobile partners is about 24 inches wide (netting a dome that’s about 30 inches wide). Ideally, you would want it to be about 12 inches wide or less to match the size of the current standard definition dish and the automatic dishes for tailgating. A larger dome is hard to manage on an RV and that’s going to be a problem when DIRECTV moves away from its standard definition service in 2019. The problem is, when you move to a smaller dish, you pull in less signal, and you have to compensate with more complex electronics. That means higher cost, and while people who buy these mobile dishes are willing to pay, they’re already pretty expensive. And keep in mind that a smaller dish could have potentially worse performance, so you’re paying more and getting less. That does not seem like a winning combination. I personally do think that at least for mobile, DIRECTV high definition dishes will get smaller as the technology improves. But for your average homeowner, there isn’t a lot of hope of seeing much smaller dishes anytime soon.